What could you create with it? Max 7 can used to create pretty much anything you like. Cycling '74 may have teased its Max 7 programming environment in slightly quirky fashion, but it seems deadly serious when it says that its new feature set will enable you to "realise your ideas faster than ever" on your PC or Mac. Describing Max succinctly is difficult, as it can be used in such a wide variety of ways, but the fundamental idea is that it enables you to patch things together to create new things. Version 7 offers numerous changes and enhancements: there's a new file browser; you can save pieces of patches for re-use later as 'Snippets'; the interface is more customisable; and your Workspaces open exactly as you left them when you previously quit the application. 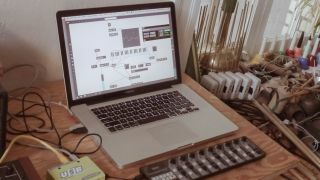 There are also new and improved objects, simple integration of your VST and AU plugins via the patcher frame, integrated drag 'n' drop media players, and easy modular patching using the Beap modules. Max 7 can also be used to host and create Max for Live MIDI and audio devices, and a selection of such devices is included. This is just the tip of the iceberg as far as Max 7's feature set is concerned - you can find out much more on the Cycling '74 website. A 30-day trial version can be downloaded, while pricing options range from a permanent license ($399) to a subscription (from $8.25 per month) or an upgrade from a previous version ($149).